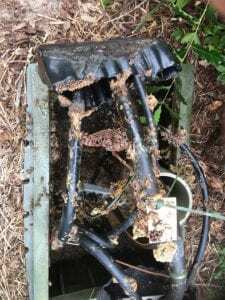 Honeybees often swarm and form colonies in electric pedestals, telephone communication units, water meter housings, and other utility equipment. These selected habitats may also include wire reels, utility pole voids, and wood crates. Underground electric pedestals transfer power from lines of service and distribute the energy to customers. These units are marked “hazardous”. Only authorized, trained professionals are permitted to service such devices. When a colony of bees presents itself into a pedestal, energy providers, such as Duke and F P L, should be notified. 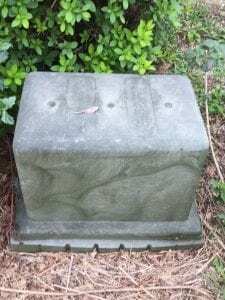 After the pedestal has been de-energized, the cover can be removed to expose the bee colony and its honeycombs. The bees can then be removed and relocated. Communication units are treated similarly to electric pedestals. Companies such as Spectrum and Xfinity maintain the units, and they should be contacted if a bee colony should appear. The cylindrical cover can be removed to extricate the beehive. Water meter housings come under the authority of city or county government (water department). Live honeybee removal and relocation is desirable. 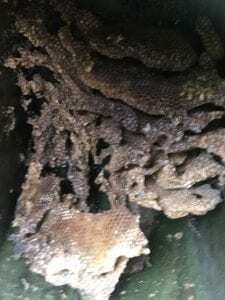 Honeybee removal and relocation from utility structures can be safely performed after professionals have been contracted to oversee the project. 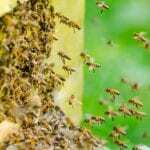 Homeowners are cautioned not to attempt treatment or removal of bees from power units. Let us learn from the honeybee and be wise like she. A summer’s surplus is diligently gathered. Nothing is free. Day-to-day her handiwork proceeds. Survival is the key. When foraging becomes scarce, there is no need to flee. Her productivity has made her home very rich–you see.